All our experiences in our lives are to help us learn to believe in ourselves. The limitations we have are in our minds, and if we can change the limiting conversations in our head, anything is possible. I was an insecure young girl and young woman until I started boxing professionally in 1996. Boxing taught me to discipline both mind and body. Within five years, I had earned four world championships. Thanks mostly to God and the best boxing trainer in the world I was voted the ‘Most Avoided Female Fighter in the World’ for two years in a row (For more, see www.Sumya.com). In 2016, I was inducted into the International Women’s Boxing Hall of Fame. Even after those accomplishments, I was humbled to realize that, like everyone else in the world, I had a limitless potential for accomplishment. Boxing instilled in me a deep, desire to be the best I could be in anything I pursue. It also awakened in me a calling to help others realize their own capacity for accomplishment. Truly, each of us is capable of more than we ever thought possible. YES. YOU. CAN. In 2006, after 10 years of dealing with the blood, sweat, tears, and politics of boxing, I spread my wings and discovered aerial fitness. Since then, I have been traveling all over the country learning from amazing circus performers. 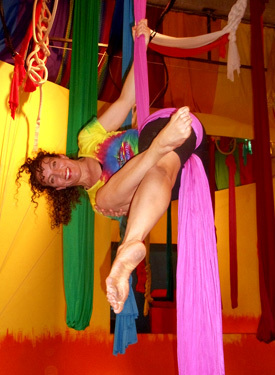 My passion for circus led me to open Learning2Fly in 2010. There are so many things I love about what circus represents. I love that it’s family focused. I love that it’s based on teamwork, but also pride in your individual contributions. I love that everyone brings their unique and individual talents together to create something magical, entertaining, and fun for others. I wanted to be a part of it. I want you to be part of it too. Let’s contribute something meaningful together. Learning2Fly is our home, and we’d love to have you join our circus family. The name Learning2Fly has a lot of meaning for me. Many of us think flying is the ultimate freedom. Yoga teaches that true freedom is not harboring any self-negating, self-limiting, and self-defeating thoughts such as “I can’t do this” or “I don’t have enough time or money to do that” or “Love is fleeting so I’ll never have real love in my life.” Insert your own limiting belief here. ________________________. Changing your beliefs is our most difficult task in life. We aim to support you in fully embracing all you are capable of, and more. You are strong. You are courageous. You are capable of so much. You are here for a reason and you deserve to create and live the life of your dreams. We would love to be part of your “Dream Come True” family. There is nothing you can’t do. I know for sure that you can’t fail when you trust in the wisdom that created you. Let’s empower ourselves and each other and create magic along the way. Come one, come all! YES. YOU. CAN. It’s a bird. It’s a plane. Wait…wait. It’s YOU at Learning2Fly. I hope to see you in class soon.